Looking in to inclines for my layout, looking through the index I have found the woodland scenics website. My question is what percentage incline is recommended for locos that won't make it to steep for them to run up? Was looking at the 3% incline? I wouldn`t say there`s any hard and fast rule because there are too many variables. Obviously you want as little incline as possible to make it easy to pull trains up hills. 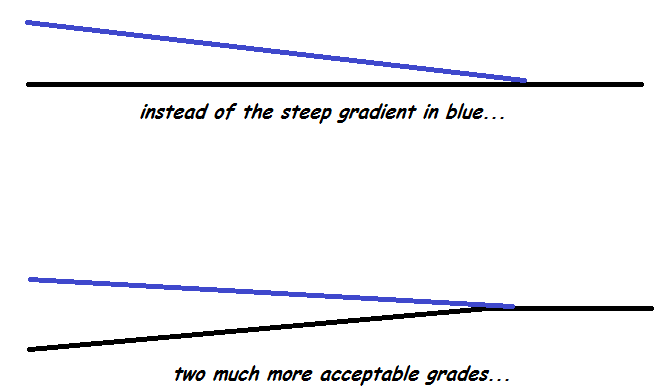 The critical area on an incline is a curve. The curve will create drag as well as working against gravity, so curves should be as large a radius as you can fit in. I would suggest testing with a variety of engines, wagons, coaches is the way to go. Work out what may be your maximum train length and set up some track temporarily on a board and try raising one end of the board to see what the trains can handle. Mix and max your locos and loads and then you will gain a good understanding of what`s practical. A lot of the literature suggests a minimum of 1 in 36 but I think this is quite steep to pull say five coaches although some locos could do it. I prefer a minimum of 1 in 70 although this does make for quite long inclines. So there you have it.....it`s a compromise unless you have a very long run to do it in. Depending on your expected loads, our club layout had a 1:30 gradient (3.33%) that most locos from 0-6-0's up could easily haul 8-10 four wheelers and probably 4 passenger cars. The top of the grade was a small terminus so there was not much extra room anyway. Most smaller US type locos could easily haul 8-10 boxcars and a caboose. This was also depending on the friction of the coaches of course. As Brian note, what sort of radius are you using or contemplating? The clubs was 36" at the summit point which was the smallest mainline radius on the layout but few home modelers have that luxury. When I was in the railways, we learned about drag factor of real life freight cars and the difference between a car on a dead level track and 1:100 was that the vehicle needed a force of about 5 lbs per ton on the level to move it, 1 in 100 roughly tripled this amount and 1 in 40 grades (as one has leaving Adelaide to climb over the hills) pushes that to over 100 lbs per ton required that the loco has to exert just to move the load. Figures for models would be in the same order but the friction relatively speaking is much higher again for our models hence the inability to roll them at slow speeds. Thanks for the replies i have been reading Novice's Upton to Dunton line and noticed he went from 4% down to 3% and finally ended up at 2%. 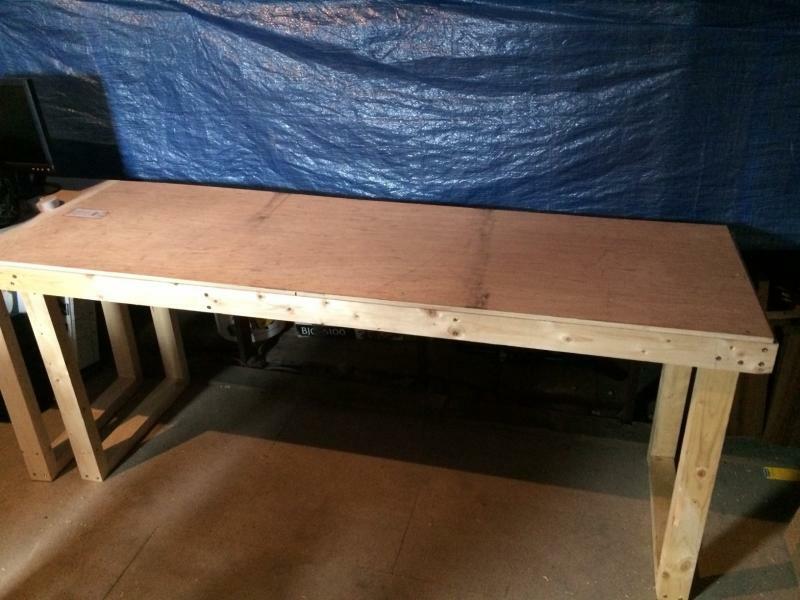 I really cant fit 2% in so will have a go at the 3% incline, will definitely require me to alter the front of the brewery and change form 1 line down to 2 (Unless i extend the baseboard) so i can fit the incline in behind. This will mean going to three lines one of which will be the incline i think. Hoping to buy the woodland scenics this week and will try to get in the loft at some point over the weekend. 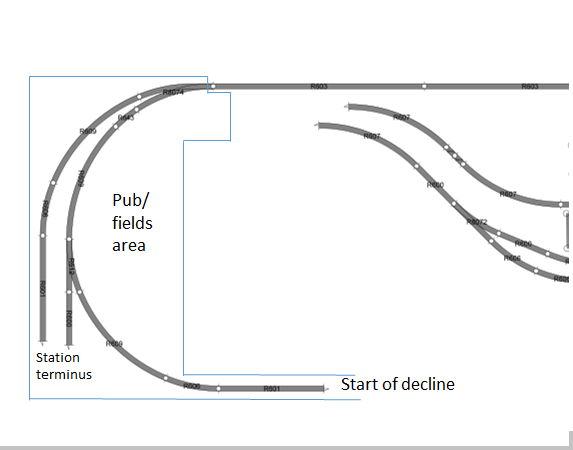 My first layout attempt had an incline that averaged out at 2.27% and partly on curves, which was fine regarding locos pulling trains but looked a bit steep to me. That said, I would have kept it if I hadn't had to do a rebuild. As long as you don't go above 3% it should be fine, it's whether it 'looks right' to you that matters. Rule 1 applies. Most locos hauling typical trains will cope with 3%. There will be exceptions. These are not always apparent until it's too late unless you have the opportunity to try every possible combination on unfixed track before committing yourself. If straight track is used then drag is reduced to the greatest possible extent. If the incline is on a curve, or if it is approached around a curve such that the tail of the train remains on that curve while the head is climbing, then the drag increases which affects the ability of any locomotive to climb the hill with a given train. I have an issue with the Hornby A1X Terriers which are tiny and light. They never hauled very much in real life but on my hills they manage just a single coach. The M7 manages two and on a good day three. By contrast the diminutive Beattie well tanks happily take two and can be persuaded to haul three despite being almost the same size as the Terrier. If you have an option to transition the gradient rather than jumping from level to climb to level (so something like a flattened S-curve in cross-section) that too cuts down on the drag. Is it possible to elevate part of your base track height so that to create the rise, the upper part goes up but not as steeply while the other bit goes down at a respectable gradient which is also fairly realistic anyway? Picture attached! Trevor my baseboards look like below and are simply a sheet of ply on the frame, so unless i make significant changes to the baseboard i don't think i would be able to achieve your idea. In hindsight i probably should of made my baseboards a little differently. Will go with the 3% rise and report back on my success/ failure. The length i have for the incline is 4m, which will accommodate the woodland sceincs 3% incline on a straight, fingers crossed. What foam would you recommend? Was looking for styrofoam recently and couldn't find it in any local hobby stores at all? Cant quite picture what you have suggested. Any chance of a rough visual diagram? Surprisingly enough, you should be able to get sheets from an insulation place or a hardware/timber outlet. I have actually used thin strips of white foam recycled from packaging. Any electrical place should have packaging between fridges that they need to dispose of and you can cut and shape it as you need it for the main level of your trackwork. WHile it is not recommended, I have used white foam with very little issue over many years and made an entire base from a recycled pair of sheets of it as left over insulation. Trevor two images below may explain what im trying to achieve. 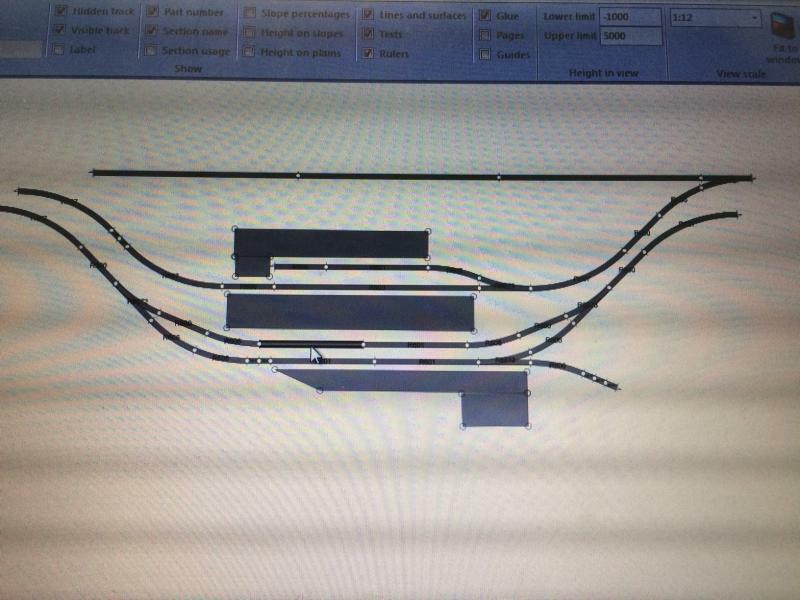 the line on the far left of the photo and the top line on track plan is the one that will have the incline. No problem thanks for you help, if i manage to get the incline and install it before i hear from you i will post a photo and see if you can suggest improvements. I have downloaded your pic and I will play with it to show you. With the point on the at the rear, I am wondering if it can be moved back so that you have a longer S curve to the back and should be then able to get a longer run up the grade... Things have been VERY busy today so when I have a straight couple of hours (I don't really need to sleep between 3 and 5 in the morning do I?) I will get through it asap. No rush i am swapped at work at the moment and have parents evenings and bits on after work so will be unable to get in to the loft to play around until the weekend. Moving the point back is fine and something i have considered but not had the chance to do yet. Hello Col, My apologies that this is not to scale. I am also not sure what your raised section will do... I presume go over and com down the other side? 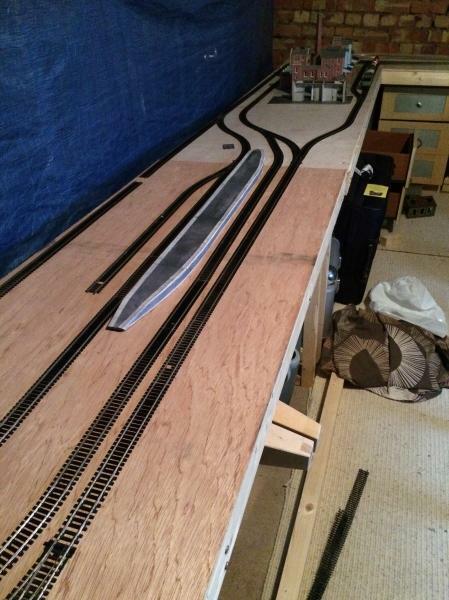 I presume the bottom half of the layout is simply double track? Colin_A_Jones wrote: Thanks for the replies i have been reading Novice's Upton to Dunton line and noticed he went from 4% down to 3% and finally ended up at 2%. I really cant fit 2% in so will have a go at the 3% incline, will definitely require me to alter the front of the brewery and change form 1 line down to 2 (Unless i extend the baseboard) so i can fit the incline in behind. This will mean going to three lines one of which will be the incline i think. Hi Colin, the killer on my layout was the 90 degree curve, which is tight too, and thus many of my trains stalled with a lot of wheel slip. I doubt you will need 4% if you have straight, or near straight track. So after buying the incline i dashed up the loft in my thermals and threw it into position. I tested all my locos, and there was a slight struggle when pulling 3 carriages as seen in pic below. 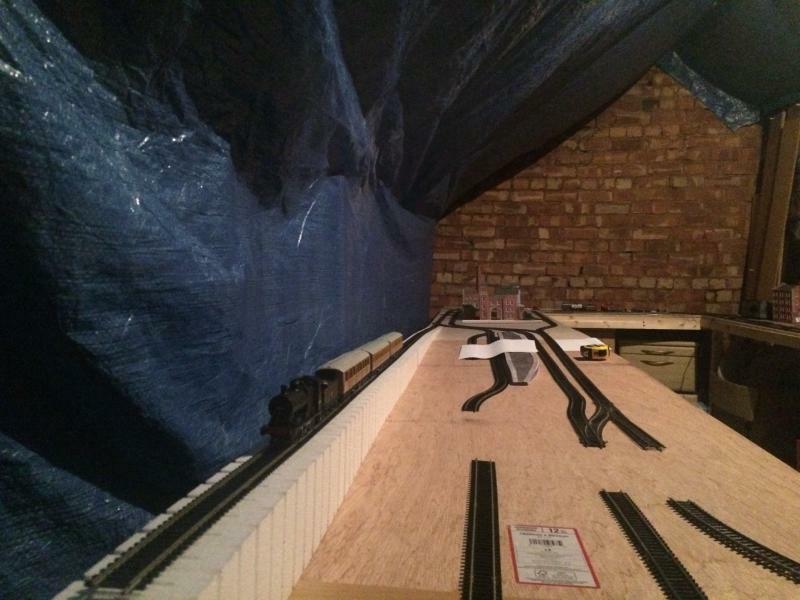 Its a good length incline i haven't as of yet played around with altering baseboard heights with foam etc. Below is the plan below for the second tier, the blue outline represents the ply. 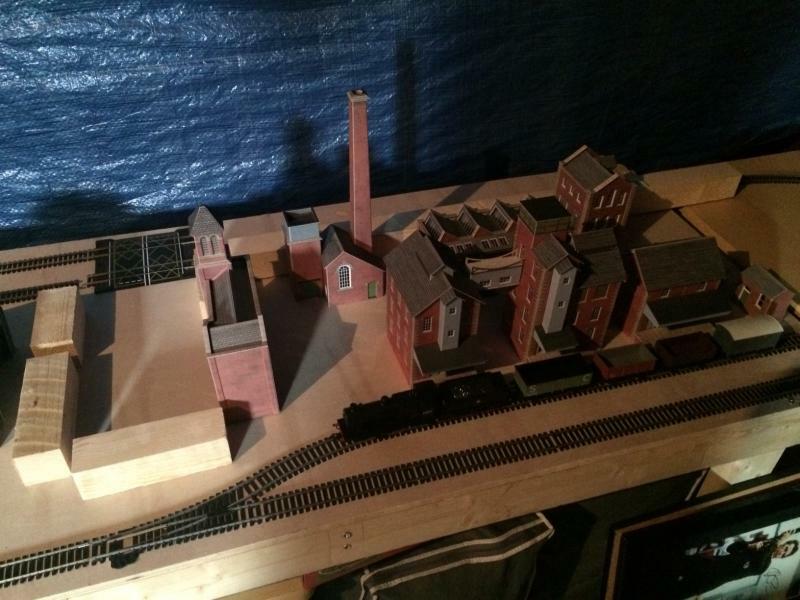 Hoping to have small terminus here but mostly i want a country pub scene in this area. The two pieces of R607 will be on the bottom tier and run straight from where they are underneath the second tier. Ihave considered another incline on the opposite side of the layout to bring the locos down but also toying with the idea of not having an incline there and just having the incline shown above as an up/ down line. 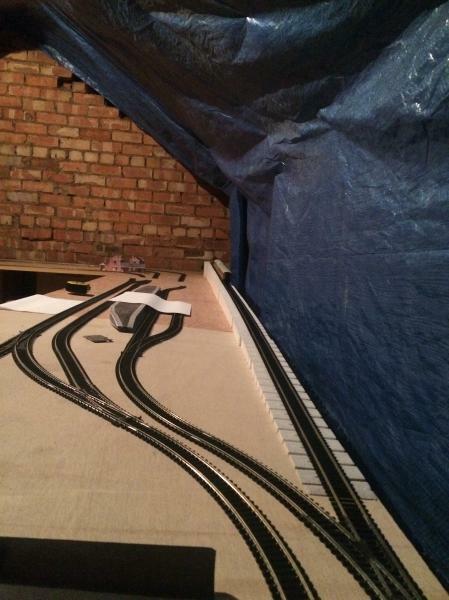 Given the length of 4m to "play around with" I am still suggesting the split the rising/ dropping of the track. If it is an interpretation of my drawings, let me know. The 1 in 30 should be OK if it is short trains you are running up the hill but the separation and splitting of the grades would not be hard to achieve and using the simple rules of physics double the lengths of trains you can haul up the hill/quantitatively ease the work your loco is doing.